Have You Heard Of Norovirus? Home > Health News > Have You Heard Of Norovirus? Norovirus is an extremely contagious virus which can make you very ill with diarrhea, vomiting and painful stomach cramps. It is sometimes known as the “48 hour tummy bug” because unless there are complications, it generally clears up within 2 days. This virus is caused by food or water which is contaminated during the preparation process, mainly from unwashed hands, improper washing of fruit and vegetables, or contact with unhygienic surfaces. Norovirus is the leading cause of illness and outbreaks from contaminated food in the US. Studies have shown that about 50 % of food-related illnesses in the US are caused by the virus with approximately 19 million cases diagnosed annually. It also contributes to an average of 60,000 hospitalizations per year, mostly among the elderly and young children. The biggest danger to people infected with the virus is the possibility of getting dehydrated if the virus persists. People with severe dehydration may have to be hospitalized to restore fluid to the body in order to recover. Risk factors for picking up the norovirus. Children attending a pre-school or child care center. Eating in a place, or buying takeout where food might have been handled in unsanitary conditions. Living in close proximity with others such as a school dormitory or an adult care center. Staying in hotels and holiday resorts, where there are many different people mixing with each other. Eating contaminated food or drinking contaminated water. Cruise ships can be particularly vulnerable to the norovirus taking hold, and spreading like wildfire among passengers and crew. This will be very challenging for the ship’s medical staff to control, because of shared dining areas, and a continuous turnover of passengers. When the ship docks, passengers who go ashore may bring the virus aboard if they have eaten contaminated food while ashore, and are subsequently infected. Food workers with norovirus can easily spread the virus to others. Not paying enough attention to hygiene standards in your own home. You can also be infected through close contact with an infected person, even a child, when caring for them – if you do not often wash your hands or the items they have handled. Risk factors in healthcare and other institutional places. Schools and colleges are high risk, and some chronic outbreaks have resulted in the temporary closure of campuses. Prisons and military camps are also notorious for the spread of this nasty gastric virus. This was borne out by the US and British troops deployed to Iraq in 2002 to 2007, when hundreds were laid low with norovirus infections. Healthcare facilities, such as nursing homes, and hospitals, are the most common places reported for norovirus outbreaks. The virus is often introduced into the facility by infected patients, staff members, visitors, and contaminated foods. The illness may be much more severe, and potentially fatal, in patients who are hospitalized or in nursing homes. If you have a friend or a loved one in a care home whom you visit on a regular basis, should you even suspect that you may be infected with the norovirus, delay your visit for at least three or four days after the symptoms have disappeared – you could still be infectious without knowing it. Abdominal cramps and watery diarrhea. A low fever and a complete lack of energy. Severe muscle pain that does not go away. Get medical attention if you have diarrhea that persists for several days, very severe vomiting, or bloody stools. Serious dehydration can quickly develop, and may require intravenous fluid intervention to help you recover. 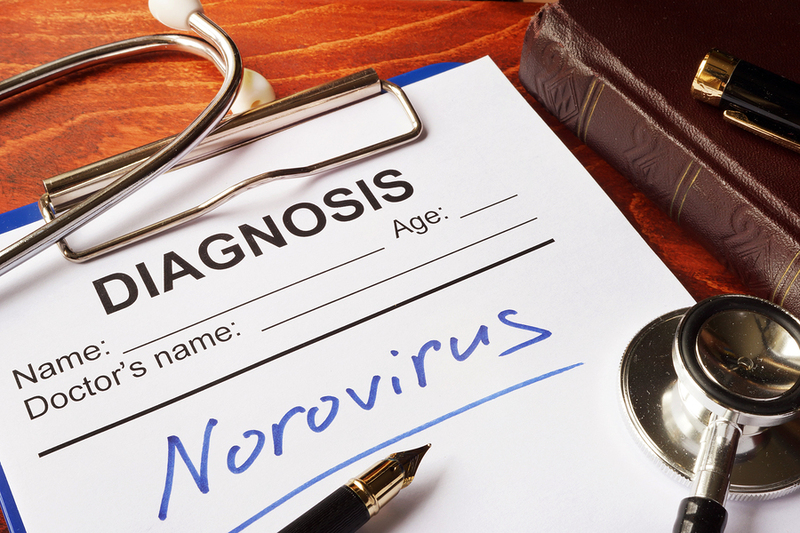 How to protect yourself from norovirus infection. The norovirus is highly contagious and can spread almost with the speed of light. Here are some ways to protect yourself from contracting and spreading the virus. When working with food, wash your hands often with soap and water especially after handling raw items like meat or fish. Wash fruit and vegetables thoroughly before eating. Salad greens like lettuce are particularly prone to contamination from the soil. Seafood, especially shellfish like oysters, are also very prone to contamination, and need to be properly cooked. Picking up the norovirus from seafood can be extremely devastating and dangerous to your health. Keep away from food you suspect may be contaminated or food that has been prepared by someone who has recently had the virus. To dispose of unsanitary matter, soak up as much as you can with paper towels and place in plastic refuse bags. Should you become infected, don’t work with food, and stay home from work for at least 3 days after symptoms have disappeared. Infected children should also not be sent to school or day-care. Finally, wash all clothes and linen which may be contaminated and machine-dry, as the heat from the dryer helps to kill the virus. Make it a habit to clean all working surfaces with a chlorine and bleach solution. In developing countries such as parts of Africa, research has shown that most cases of acute diarrhea and vomiting are caused by norovirus. In these areas there is an estimated 50,000 deaths per year among children under the age of 5. There is no specific treatment for norovirus, as the recovery is governed by your immune system, and usually clears up in a few days. Visit the doctor if complications arise. Norovirus is a serious illness. There is an old saying that is still often used, which refers to all sorts of situations: “Prevention is better than cure.” This certainly applies very significantly to norovirus.